Everyone knows the story of Vlad the impaler and how he was the inspiration for the classic monster Dracula. His love for tormenting his victims has traveled far and wide, but how did he become that way? The Brothers Dracul #1 by Cullen Bunn (X-Men Blue, Deadpool, Venom) explores the background of Vlad and what altered his personality to create such a wicked murderer. It all starts when the Ottoman Empire takes Vlad and his brother Radu as captives. Even though they are prisoners and are forbidden to leave, because they are of noble blood, they are treated in high esteem and are taught many new skills. These skills include archery, horseback riding, fighting, and most important, how to hunt and kill vampires. I look forward to seeing how this progresses in issues to come. 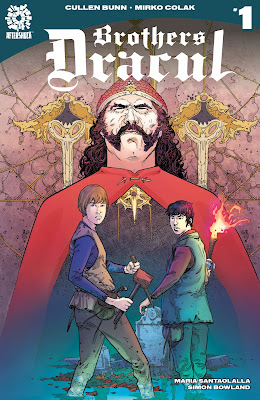 I enjoyed the flashback to Vlad’s teenage years in that we got to meet Vlad’s father, and understand how Vlad and Radu became prisoners of the Ottoman Empire. I wish there was more background on Vlad’s dad as he seems like an interesting character but unfortunately he wasn’t focused on much. Radu is in the majority of the comic, yet I don’t feel like I know much about his personality other than the fact that he is against Vlad murdering people. Vlad’s character has the greatest execution but even he is not fully complete. He seems angry and put-off as an adult as well as a teenager as we look at the flashback, but that is all we know of him. We never really find out why he is that way. I’m hoping in the next issues to come it will delve deeper into the characters and their backgrounds and show more of their personalities and who they truly are so the reader can actually care about the characters.